For a limited time, you can save $300 on a ProRock 44™, Trail Leader Axle Package™ or Serious Performance Axle Set™ for a Jeep Wrangler JK. We’re offering a $300 discount on our US-made JK44 chromoly 1350 axleshaft kit when purchased with a ProRock 44 or one of these two axle packages. The front Dynatrac JK44 Axleshafts are made from high-strength 4340 chromoly. These 30-spline shafts come with 1350 U-joints, and are a direct fit to retain the factory wheel hub. They fit in both Dana 44 and Dynatrac ProRock 44 axles without any modification to the housings. The JK44 Axleshafts only fit non-Rubicon models, and will not fit in housings that use the factory Rubicon Tru-Lok locker. Click here to read more about the Dynatrac ProRock 44™ and to use our online configurator to build one for your Jeep JK. 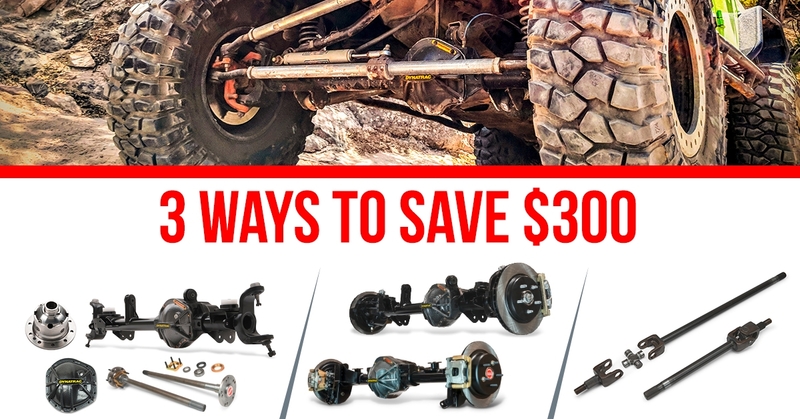 This package gives you all the Dynatrac strength and durability you need without requiring wheel changes or other costly upgrades that you simply aren't necessary for the type of off-roading you do. You get an assembled ProRock 44™ front axle and the following to upgrade your factory Dana 44: Dynatrac JK44 Axleshaft Upgrade kit, 35-spline ARB Air Locker, Dynatrac Pro Series diff cover, ring-and-pinion gear set and a set-up kit. Click here to read about all of the exclusive features included in the Dynatrac Trail Leader Axle Package. Click here to read about all of the exclusive features included in the Dynatrac Serious Performance ProRock 44/60 Axle-Set.